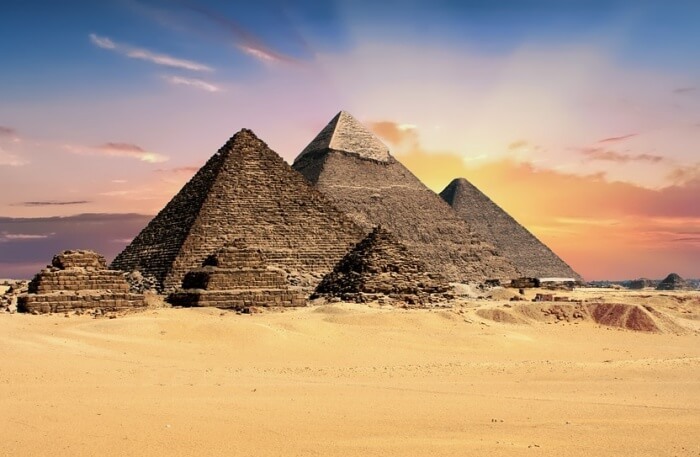 Egypt, the land of pharaohs and pyramids never fails to amaze its visitors with its rich culture, mysteries and monolithic pieces from the medieval times. One such mighty monument that has hundreds and thousands of spectators completely in awe is the Great Sphinx Of Giza, an imposing statue body of a lion and head of a human. Carved out of a single block of the surrounding limestone bedrock, this colossal Egyptian antiquity is claimed to be the oldest and the largest known sculpture in the world. The prime reason to why the Sphinx was constructed is still unknown, but some historian buff and archaeological experts believe that the statues were sculpted to guard important areas. Likewise, the Great Sphinx Of Giza was constructed to guard the large three pyramids of Giza i.e., pyramids of Khufu (Cheops), Khafre (Chephren) and Menkaura (Mycerinus). 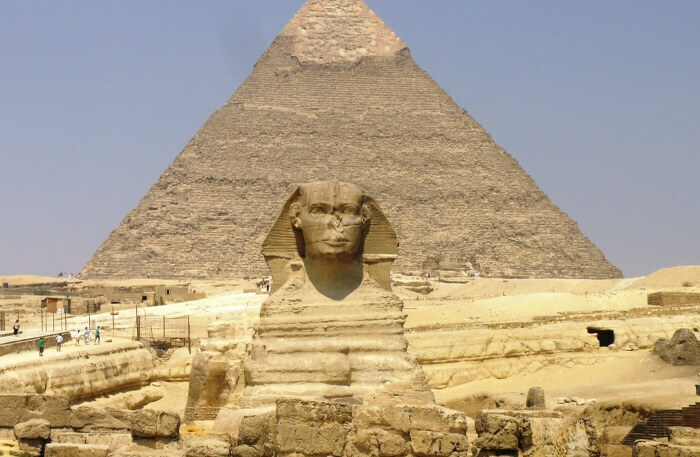 Archaeological also believe that this gigantic sphinx was once colorful with the face painted red and the body painted with blue and yellow color. They also claim that the Sphinx once has a long beard and a nose, which are now missing. Built-in 2500 BC during the Fourth Dynasty of the Old Kingdom, the Great Sphinx Of Giza in Egypt sits on the Giza plateau right in front of the Great Pyramid of Giza. Facing east, this stunning monument shimmers with the rising sun each morning and is 73 meters long and 20.21 meters high. 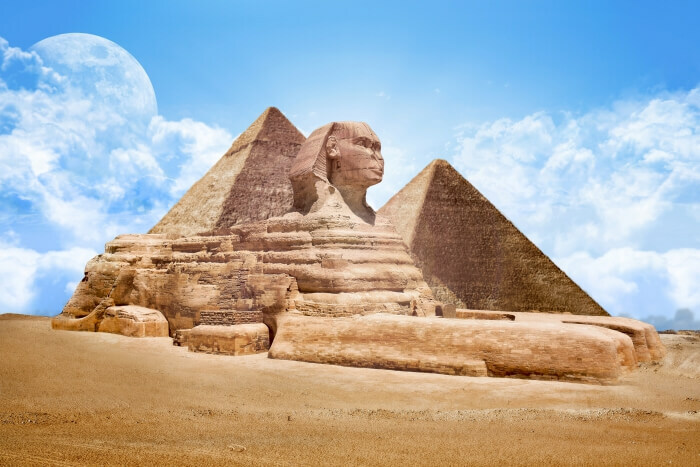 The Sphinx was submerged beneath the desert and the first documented attempt to clear the sand was undertaken in 1400 BCE with the pharaoh Tuthmosis IV. After a series of the restoration process, the giant structure once again found itself buried under the sand up to its neck when Napoleon came to Egypt in 1798. Later, there were many excavation projects conducted to clear the sand from 1816 to 1858 by some of the well-known antiquarians including Giovanni Caviglia, Auguste Mariette, and Gaston Maspero, but were forced to abandon the process due the sand. Great Sphinx Of Giza in Egypt resides just about 10 km west of Cairo, on the west bank of the Nile River in Giza. The Sphinx is situated close by to the three large pyramids called, the Great Pyramid of Khufu (Cheops), Khafre (Chephren) and Menkaura (Mycerinus). Needless to say, the climate of Egypt is typically hot throughout the year with temperatures rising to 68 degrees Fahrenheit in Cairo. 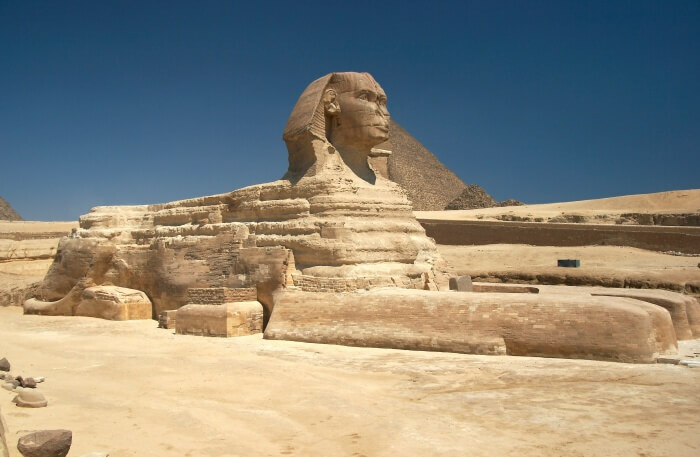 Therefore, the best to visit the Sphinx would be from October to April, when the temperatures are slightly moderate. The Missing Nose: There are several stories and speculations revolving around the missing one-meter nose of the Sphinx. Some people accused Napoleon and his troops as the prime culprits behind destroying the nose when he came to Egypt in 1798. 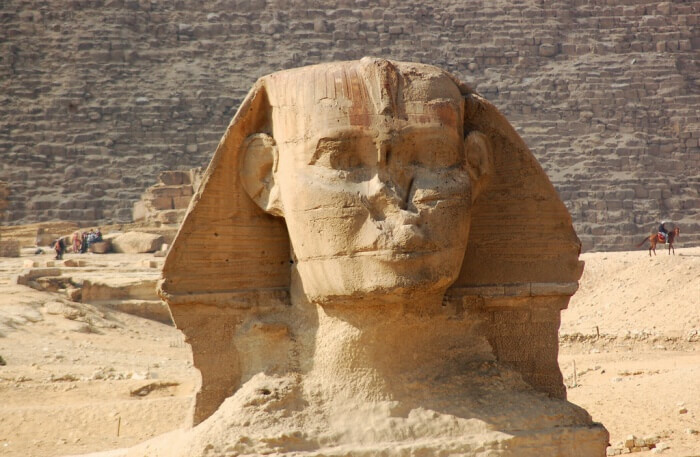 There are also lots of documented evidence stating that the nose of the Sphinx was destroyed by the Muhammad Sa’im al-Dahr, a Sufi Muslim leader of the 15th century. Muhammad was against the people worshiping the Sphinx and in a rage destroyed the nose. The Sphinx Once Had Bread Too: Archaeologists claim that this monolithic sculpture once had a beard too which was eventually crumbled may be due to natural sand erosion. The fragment of the missing bread was found between the front paws of the Sphinx in the 19th century, which is currently being displayed in the British Museum in London. This Ancient Sculpture Was Once Multi-colored: Although the Sphinx has subjected to many wears and tear due to strong winds and thousands of years of erosion, there are few relics of red paint on the statue’s face, giving rise to assumptions that the Sphinx was once a colorful sculpture. You can also find some ruins of blue and yellow color on the body of the Sphinx. It is one of the oldest and the largest known sculpture in the planet: With colossal dimensions of 73 meters long, 20.21 meters high and 19 meters wide, the Great Sphinx Of Giza is the largest single sculpted statue in the world. An ancient wonder of the Egyptian civilization, the Pyramids of Giza will leave you stunned with its gigantic height and puzzling structure. 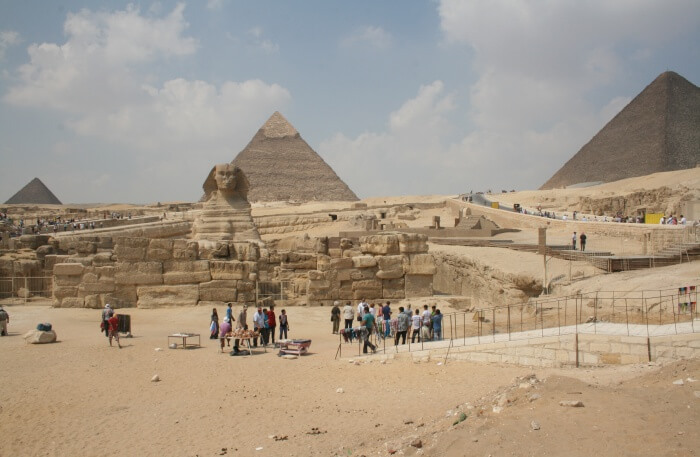 This archaeological site includes three great pyramids of Khufu (Cheops), Khafre (Chephren) and Menkaura (Mycerinus). It is assumed that nearly 100,000 workers were employed to complete the construct this monolithic sculpture. You can also explore the internal corridors, chambers, and galleries of the pyramids. 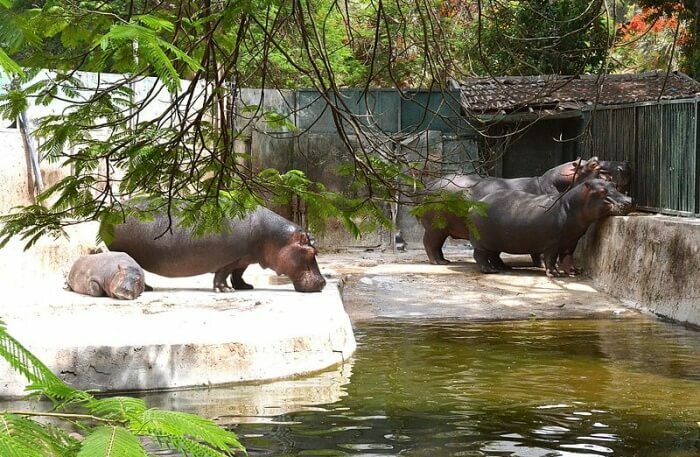 If you are an animal lover, then a visit to the stunning Giza Zoo is certainly an adventurous retreat. The zoo is densely inhabited by endangered animal species including Egyptian gazelles, mountain goats and rams, and heron. The zoo is also home to many stunning species of birds such as ibis, lovebirds, flamingos, vultures, falcons, and macaws. Egyptian cobra, tortoise, Nile crocodiles, and American alligators are few other endangered animal species found here. 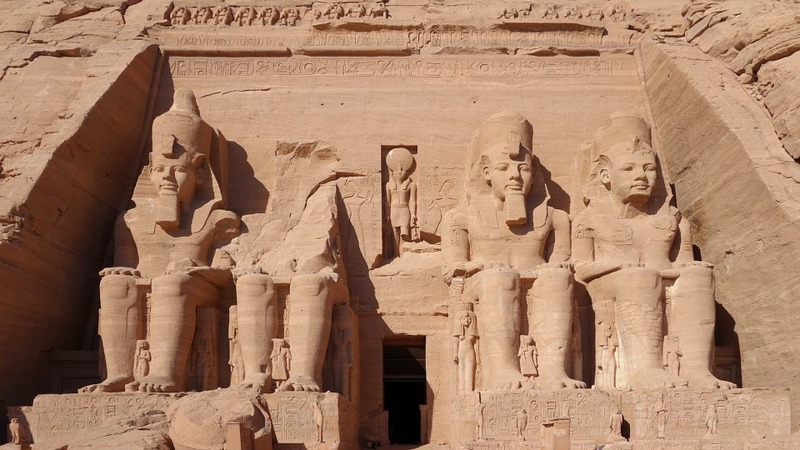 Yet another monumental sculpture and Egypt’s top tourist attractions is the impressive Abu Simbel, which lies near the near the Egyptian border with Sudan. 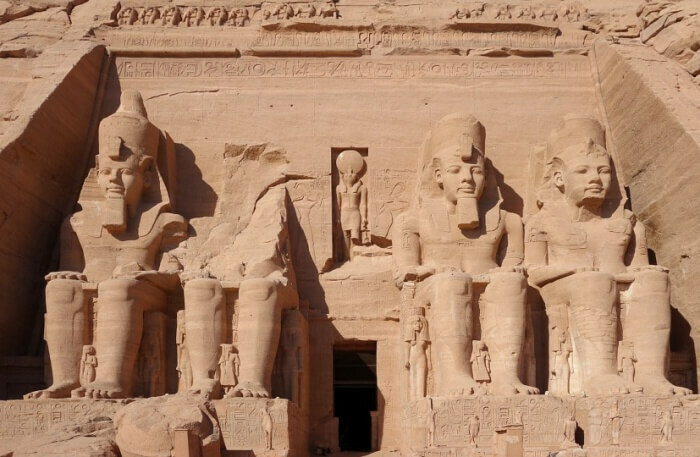 The four external rock figures of a seated pharaoh Ramesses II on their thrones at the entrance symbolizes the grandeur and magnificence of Egyptian civilization. The temple had to be relocated from its original location due to intense flooding. It has been labeled as a protected UNESCO World Heritage Site. Nestled amidst sandy desert is the peaceful Oasis of Siwa surrounded by hectares of date palms and free-flowing freshwater springs. 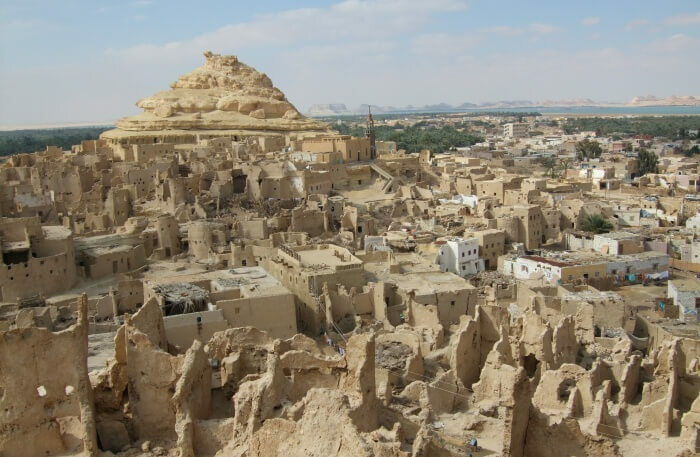 It is one of the most isolated settlements in Egypt and houses some thirty thousand inhabitants. This remote paradise is quite popular among travelers seeking a laid-back vacation in tranquil settings. However, as the location is quite remote with bare minimum amenities, we do not suggest making a base out of this place. How to Reach Great Sphinx Of Giza? By bus: If you are staying in Tahrir Square area in center Cairo, then you can easily reach the sphinx via private buses available from the center to Giza Pyramids. Traveling through bus will cost you around 2 LE (Egyptian Pounds). There is a bus stand right behind the famous Egyptian Museum. You can also catch a micro-bus from the same bus stand but these buses are comparatively more crowded. By Taxi: If you prefer travelling comfortable and peacefully, then consider hiring a private taxi from the center. A nominal taxi fee is 30 LE (Egyptian Pounds) but make sure you use your bargaining skills to get a good deal. If you are solo female traveler, then traveling through private taxis is highly recommended. By Metro: The closest metro station close to the sphinx from Cairo is the Giza metro station located at a distance of 10 kms. Travelling through metro is probably the cheapest costing just 1 LE (Egyptian Pounds). Known for its vibrant history, monolithic sculptures, and pyramids, Egypt is undoubtedly an idyllic hotspot for travellers seeking an adventurous vacation. 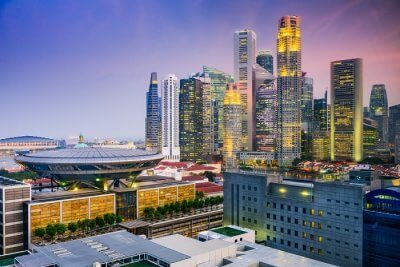 Besides, the country is also known for its medieval mosques & temples, exotic beaches, national parks, and museums. 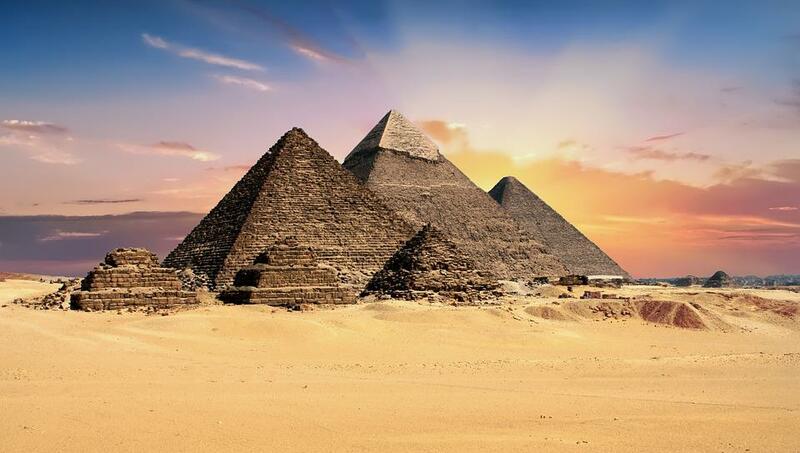 For an exotic vacation to Egypt, the ancient land of Pharaohs, contact TravelTriangle now. It is high time you pack your bags!